For the past two years, BetChain has been a pioneer in the Bitcoin casino space and its latest promotion is another first for the industry. BetChain will be offering players up to 50 free spins every week as its newest promotion, becoming the first Bitcoin casino to provide such an offer. Betchain.com has always provided an excellent player experience at its casino, by adding hundreds of new games, a total of 7 different languages, excellent bonuses and now an incredible promotion. While other casinos have stopped accepting players from certain countries or are lacking provably fair technology, BetChain has stayed the course and offered these and more. The addition of free slot games through the no deposit free spins is just the latest unique perk from BetChain. Every Friday, BetChain Casino will be automatically crediting its players with free spins – as many as 50 at a time. Only registered players will be eligible for this offer. BetChain will also be running a special social media campaign on Twitter where players can use the #FreeSpinsFriday hashtag to stay up to date on all details with this promo. Not only will Betchain’s players greatly benefit from being offered free spins every week, but it will surely boost the site’s already impressive affiliate program. 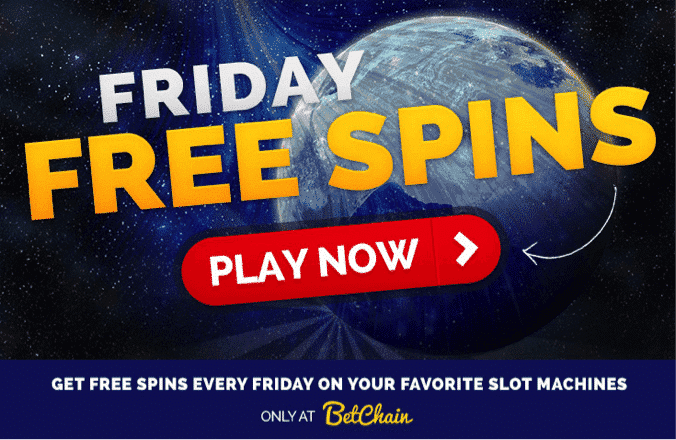 BetChain boasts one of the world’s largest casino affiliate programs, and with affiliates now able to offer free spins as incentive, the traffic is sure to increase. BetChain is achieving another incredible first and Free Spins Friday is certainly going to impress a lot of players. Stay tuned for more updates and details about the promotion, and of course follow #FreeSpinsFriday on Twitter for more information.